VARINDIA UDAY Express - Indian Railways new luxury Double-Decker AC train ready for roll-out : Here are the Details You should Know about...! UDAY Express - Indian Railways new luxury Double-Decker AC train ready for roll-out : Here are the Details You should Know about...! The Second UDAY Express or Utkrisht Double Decker Air Conditioned Yatri Express are completely Double-Decker AC chair car trains designed by Indian Railways after a long waiting now it is ready for roll-out. The coaches of the train have an anti-graffiti vinyl wrapped exterior and have been given a bright color scheme of yellow, orange and pink - somewhat similar to that of the Tejas Express. The train service has been envisioned as a 'luxury' train service for business travelers. According to Indian Railways, UDAY Express will cater to the "busiest routes" and increase carrying capacity by 40%. These trains have a seating capacity of 120 per coach (50 for upper deck, 48 for lower deck and 22 on the ends) as compared to Shatabdis which can seat up to 78. The “luxury” double-decker chair car service, aimed at business travellers, has several comforts like on-board mini pantry and automatic food vending machine. Manufactured by Rail Coach Factory (RCF), Kapurtala, the UDAY Express train is ready but will only be launched after Lok Sabha elections 2019 owing to the Model Code of Conduct. 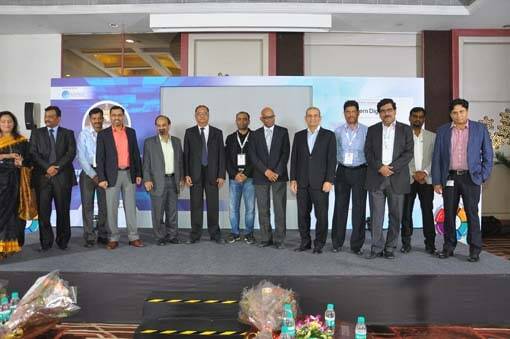 The first UDAY Express train was launched last year between Bengaluru and Coimbatore. 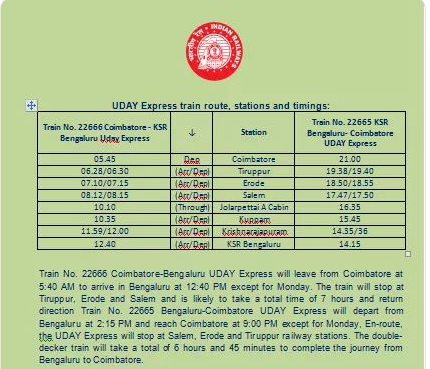 The route for the second UDAY Express has not been announced yet. Financial Express Online brings you an exclusive preview of the double-decker Indian Railways train. 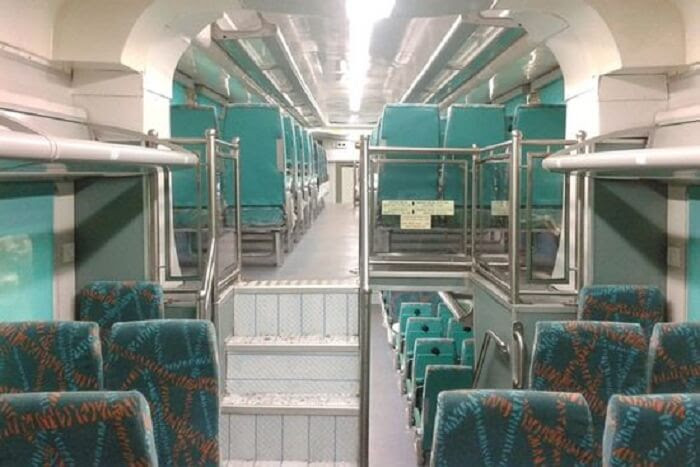 The new UDAY Express double-decker train has six AC chair car coaches with a seating capacity of 120 each. Additionally, there are three AC Chair Cars with a mini pantry and seating area. These coaches can seat up to 104 passengers. Two power cars for the UDAY Express train are also ready. 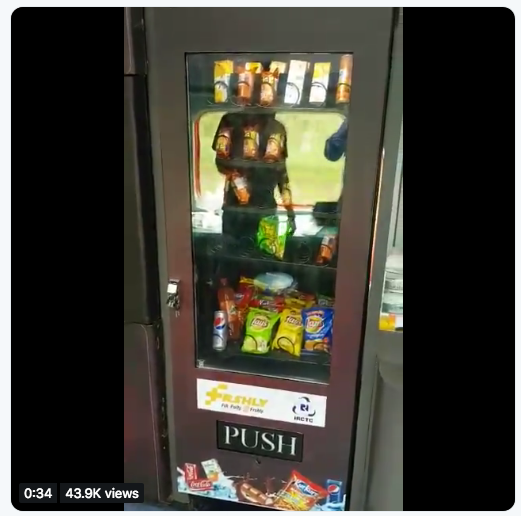 The Bengaluru-Coimbatore UDAY Express became the first train on the Indian Railways with an automatic food vending machine operated by a tablet. The new double-decker train will also have a food and tea/coffee vending machine in each mini pantry. RCF Kapurthala has also fitted an LED screen in the pantry and dining area for the entertainment of passengers. Incidentally, the first double-decker train of Indian Railways was also manufactured by RCF, Kapurthala. The Bengaluru-Coimbatore Express was introduced by completely refurbishing a double-decker coach train. 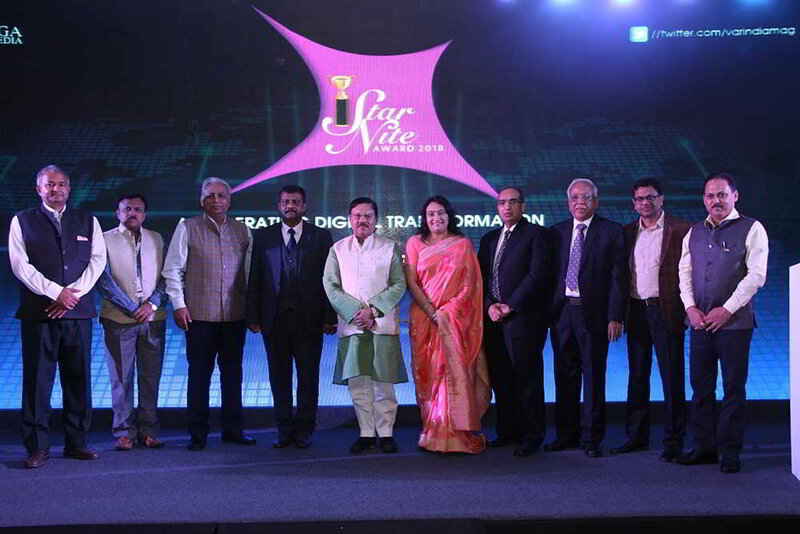 The second UDAY Express, however, has been manufactured from scratch. 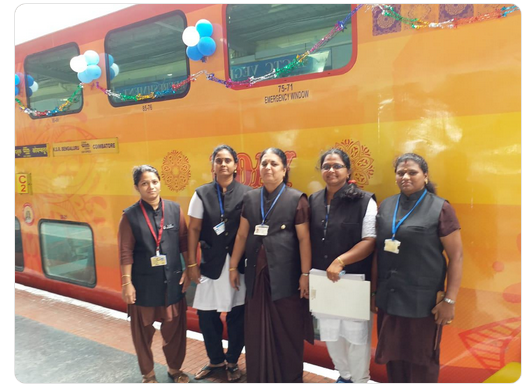 RCF, Kapurthala is the only rail coach factory of the national transporter which has successfully rolled out all new branded offerings such as Tejas Express, Humsafar Express, Antyodaya Express, Deen Dayalu coaches and now UDAY Express.